In the certainty of the growing importance of culture as an indispensable instrument for the construction of a full citizen’s condition, as well as its relevance in the economic and social domain, the Municipal Council of Santo Tirso, within its competences, has promoted and encouraged its development, either by building new cultural facilities or by diversifying and consolidating a program based on strict quality criteria. The project of the International Museum of Contemporary Sculpture will perhaps be the most revealing example of this policy, which is perceived by the scrupulous fulfilment of the artistic criteria that guided its execution from the first moment, and by the strict respect of the programmatic principles initially defined, namely organization and management of the collection that ultimately affirms the primacy of art. 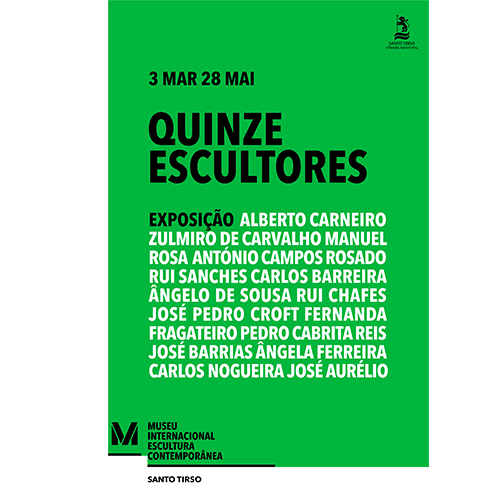 This exhibition – 15 Sculptors – includes works by the Portuguese authors represented in the Museum’s collection and constitutes in itself an example of the diversity, aesthetic and conceptual wealth of the contemporary arts, manifested in the heterogeneity of the nature and characteristics of the works exhibited, on the intellective horizon that informs them, as well as in the dissimilarity of patent languages, emphasising the reach and power of art as a superior form of expression and transformation of thought and mentalities. Sessions facilitated by the Museum team allowing to deepen the knowledge about the respective museum collections. These courses take as their center of attention the expositions present in both Museums, articulating in an integrated way transversal contents that range from contemporary art to archeology through architecture, trying to help us gain the freedom to question and share perceptions using gaming dynamics and small playful experiences. Trails lasting 2 hours by some significant works of the contemporary outdoor sculpture collection, spread throughout the green spaces of the city of Santo Tirso.